This document outlines the requirements when establishing an external web portal server. 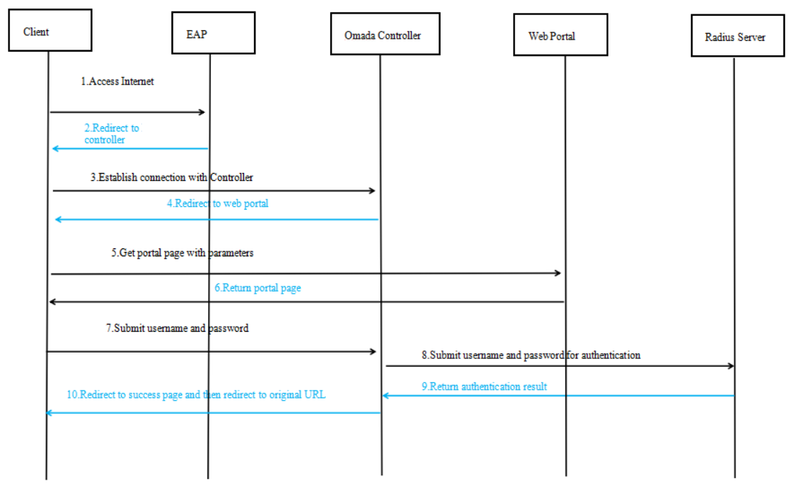 In Omada Controller, External Web Portal can only be used when the portal authentication type is External Radius Server. Please note that the “id” of these elements in your form should be the same as this example. The method to get the value of “username” and “password” can be defined by yourself, but the value of “clientMac”, “clientIp”, “ap”, “ssid”, “radioId”, “redirectUrl” must be obtained from the Http Request’s URL. I have a question, the user name parameter, does the portal verify it? Since it is not specified in the configuration of the portal. I am having many problems with this installation, if someone can help me I would appreciate it. The username and password will be forwarded to the RADIUS server, and it is the RADIUS server verifies the username/password parameter. You can use the RADIUS server, such as FreeRADIUS to finish the authentication. The Linux version of Controller 3.1.4 is under testing. It will be published later.